You can't miss her. June Stevenson, in her mid-50s, is a Nordic walker who struts around Auckland city every day, poles in hand. And not only does Mrs Stevenson enjoy the cardio exercise, as the only certified instructor for the International Nordic Walking Federation in New Zealand she is converting others. Nordic walking is based on cross-country skiing and originated in Finland as a way for cross-country skiers to exercise in summer, using a specific type of carbon-fibre pole that enhances stability. Since first trying the activity in 2004, Mrs Stevenson now runs a business helping others experience the benefits of Nordic walking and training people to teach others the correct technique. Classes, workshops and free trials are available year-round. 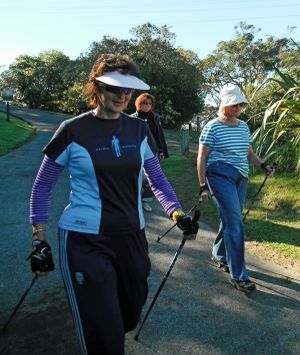 Nordic walking in New Zealand is not confined to snowy slopes and fields as in Europe. Instead, Mrs Stevenson says, "I love to teach on the beach. And I'm just as happy on Ponsonby Rd as I am on a Waiheke trail." She says the activity "uses 90 per cent of muscles 100 per cent of the time". "It's a fitness-first focus but has a great transfer to people with mobility difficulties and neurological conditions." Kay McGarry, central Auckland field officer for Parkinson's Auckland, is a fan. "I have a number of clients who have benefited from Nordic walking. It really helps improve their walking pattern, increases step stride, [and] improves rhythm and arm swing. "Most of all it is fun, and often under professional instruction, which really helps motivate my clients." Mrs Stevenson would like people to see the health benefits of the activity not just for neurological patients but for anyone who is willing to give it a go. Chris Dickie, 67, has been attending lessons for a short time and already feels the benefits. "The main thing is cardio. It's not just ordinary walking. People laugh, 'Don't you know how to walk?' [they say], and we don't." Mrs Stevenson doesn't think there is a stigma around Nordic walking but "a lack of understanding". "If anybody tends to be ignorant or make a comment, it's because they're unaware of its benefits." Poles designed for this type of walking cost $159 to $299 a pair but never need to be replaced. "If somebody is doing an activity that improves their fitness then it is a positive," says Mrs Stevenson. "You naturally get a better posture. With the addition of the pole, they interact with the ground, [and there is] a better ability to activate upper body muscles."